These how to cook a turkey instructions are for the Turkey Novice and a refresher for the Turkey Expert, as if you need to be refreshed, but you never know. Christmas dinner is a feast, complete with many fancy side dishes, gravy, cranberry sauce, and the star of the event: the big gobbler. Home cooks right across Canada and the USA sidle up to the kitchen counter and whip up a truly amazing dinner. But for many people it’s a time to panic. 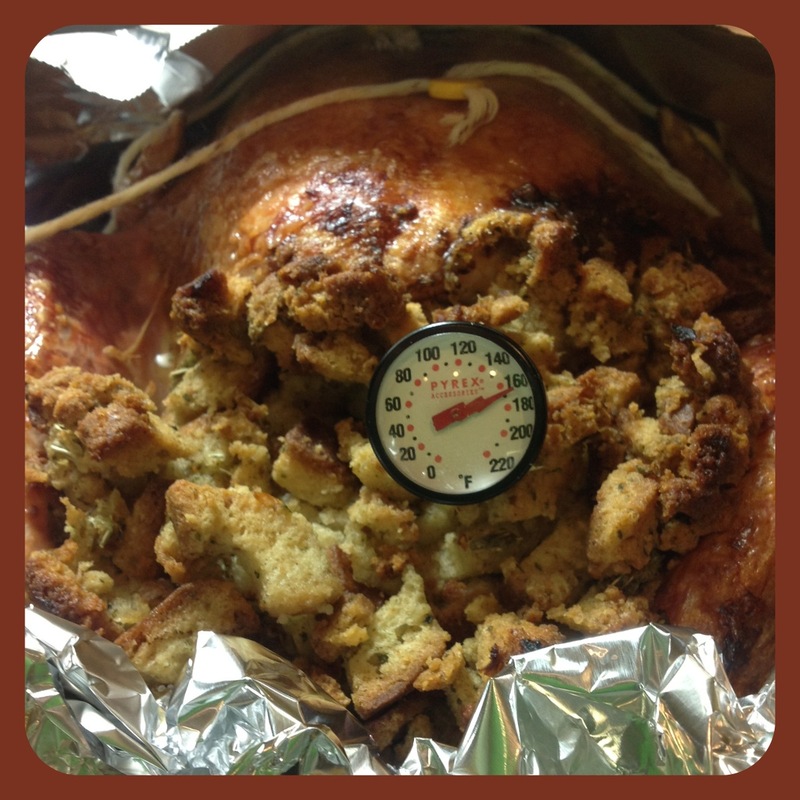 Turkey Rookies can go into a complete tail spin at the mere mention of “preheat oven to 325ºF (160ºC)”. Roasting a turkey is a very personal experience. There as many methods out there as opinions on who should be our next great leader. Chefs debate what the perfect temperature to roast is. And some professional cooks will argue that deep fat frying is the way to go. But before you can compete with the pros you need to know the basics. So for all you Turkey Virgins follow these steps for your inaugural turkey success. 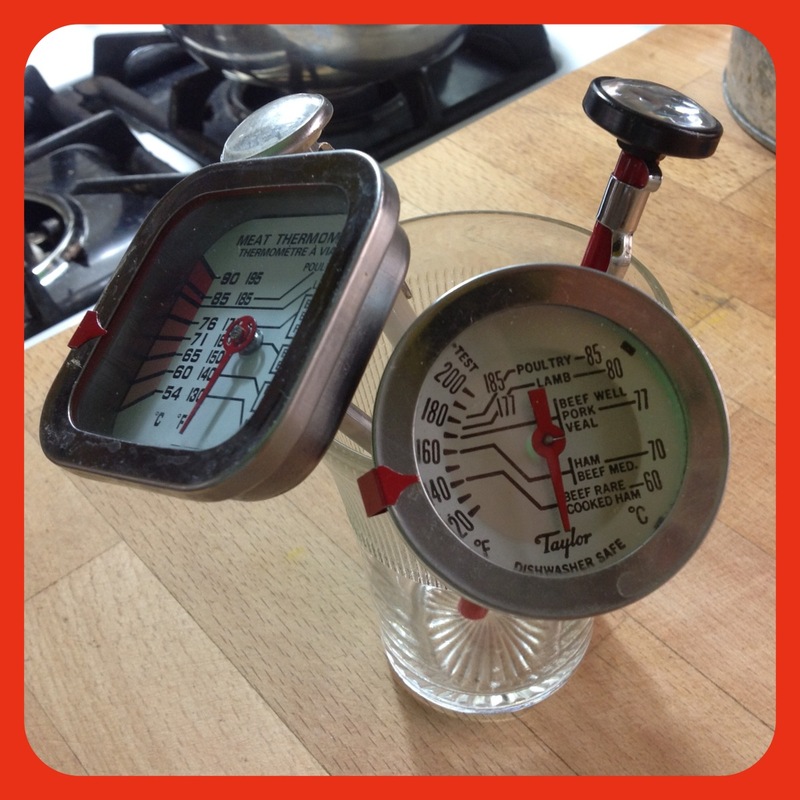 Buy a meat thermometer. The only safe effective way to tell if a turkey is cooked is by internal temperature. What can I say? I have a lot of meat thermometers and there are more in the drawer. Decide on how many people you’re serving and then allow 1.5 pounds per person. Sound like a lot? Well you need to factor in that a turkey has bones and then there is the dreaded shrinkage, plus you want leftovers. 1.5 pounds is the magic number. They both are great choices depending on your needs. Some people swear by fresh, but I love the convenience of buying a frozen bird. I get to pick it up before the Christmas rush and then store it in my freezer until I need to start the thawing process. For a frozen bird: Place the frozen turkey on a dish to catch any liquid and allow one day for every four pounds of turkey. Here’s where not goofing around in math class will finally come in handy. A sixteen pound turkey will take four days in the fridge. Don’t even think about thawing it on the counter, and yes I know our parents used that lovely method but it is one of the best ways to spend most of the day after Christmas in the Emergency Department. You can’t smell if food is contaminated but your gastrointestinal tract can figure it really quickly out. To overstate: Thaw the turkey in the fridge. Okay, you forgot to take the turkey out of the freezer and its 8:00 am on Christmas morning. Don’t panic, yet. Submerge the frozen bird in cold not hot water. Keep changing the water every 30 minutes. It should take about 30 minutes per pound so that sixteen pound bird should be thawed in 8 hours. As long as you don’t stuff it you’ll be eating some time around 9:00 pm. Just another really good reason why you should write yourself a note to take that sixteen pound frozen bird out of the freezer four days before you need it. If you are reading this article on December 21 and you are serving it on December 25, START THAWING YOUR TURKEY IN THE FRIDGE TODAY. Fresh turkeys are usually bought a couple of days before Christmas. But I totally hate grocery shopping with the frenzied, panicked masses, hence my attraction to the frozen bird. I really love the turkeys that you cook from frozen. No need to thaw. The turkeys are brined before they’re stuffed and then flash frozen. Brining at home is very popular, and produces an extremely juicy turkey. I let the pros do the brining for me, which is another reason why I buy the cook from frozen turkeys. For the turkey challenged these frozen birds are really the easiest to cook. All you do is remove the wrapper, place the frozen turkey on a rack in a shallow roasting pan, rub on some canola oil and put it into the oven. You test for doneness exactly the same way as a standard turkey and it comes out moist and juicy every time. For ease and convenience it’s my bird of choice. I buy either a President’s Choice Cook from Frozen or a Butterball Cook from Frozen. Because they are brined before they are frozen, some people feel that they taste salty. I don’t add salt to any of the vegetable side dishes nor to the turkey stock, so the only salt we are getting from the turkey dinner is from the brined bird. Whenever you are handling food you need to make sure that your hands are clean. To stuff or not to stuff? Health Canada says no. 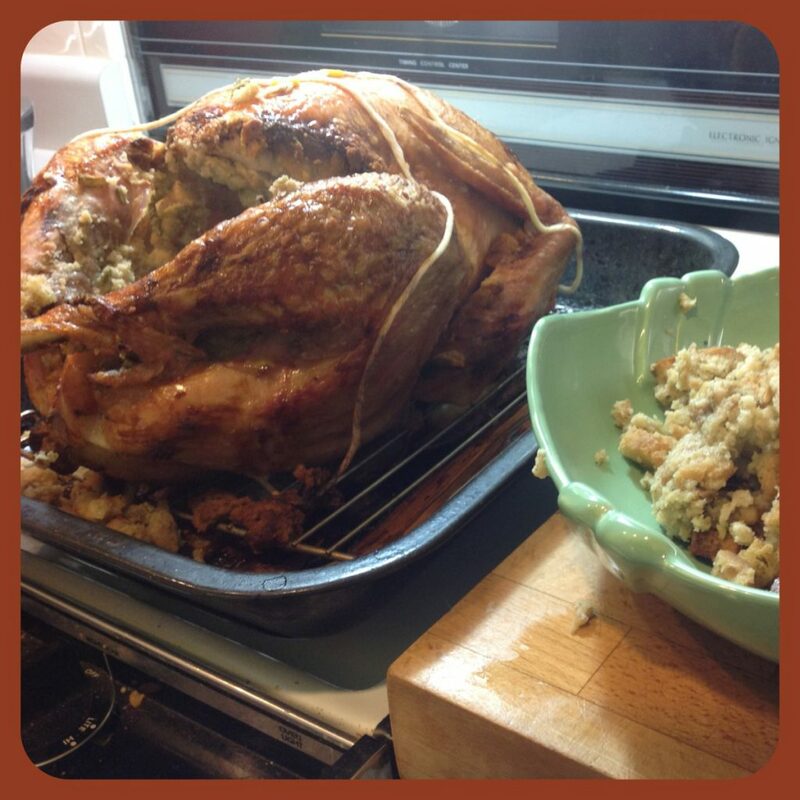 Stuffing is the ideal breeding ground for bacteria. They recommend that the stuffing is cooked separately either in an oven friendly dish or on the stove top. They also say that if you swear by your family recipe, skip any raw ingredients, stuff loosely, cook till you reach an internal temperature of 165ºF (75ºC) and then remove the stuffing from the bird, you might be alright to go. How long to cook? These are guidelines: for an unstuffed bird, the time is longer for a stuffed bird, which, according to Health Canada, you aren’t supposed to do! Unless you are cooking a cooked from frozen turkey. Oh, the rules…..
Wash the sink out and rinse well. Get out a shallow roasting pan with a rack and set beside the sink . A shallow roasting works best. You want to roast the turkey, not steam it. 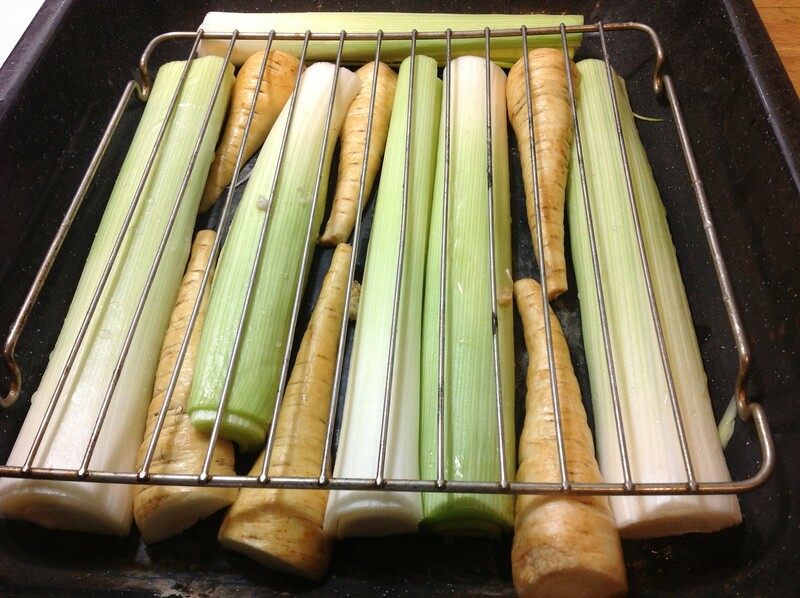 For the best ever gravy ever: wash and cut leeks and parsnips in half and place in the bottom of the roasting pan. Place the wire rack over top. 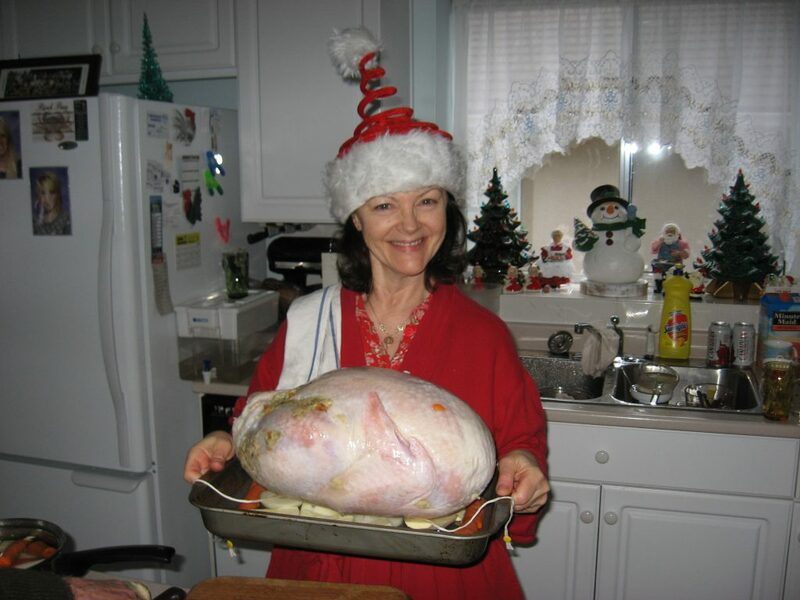 Have the stuffing ready, if you are going to stuff the bird, see above To stuff or not to stuff? Remove the bags of “goodies” from the large inner cavity and the neck from the smaller neck cavity. 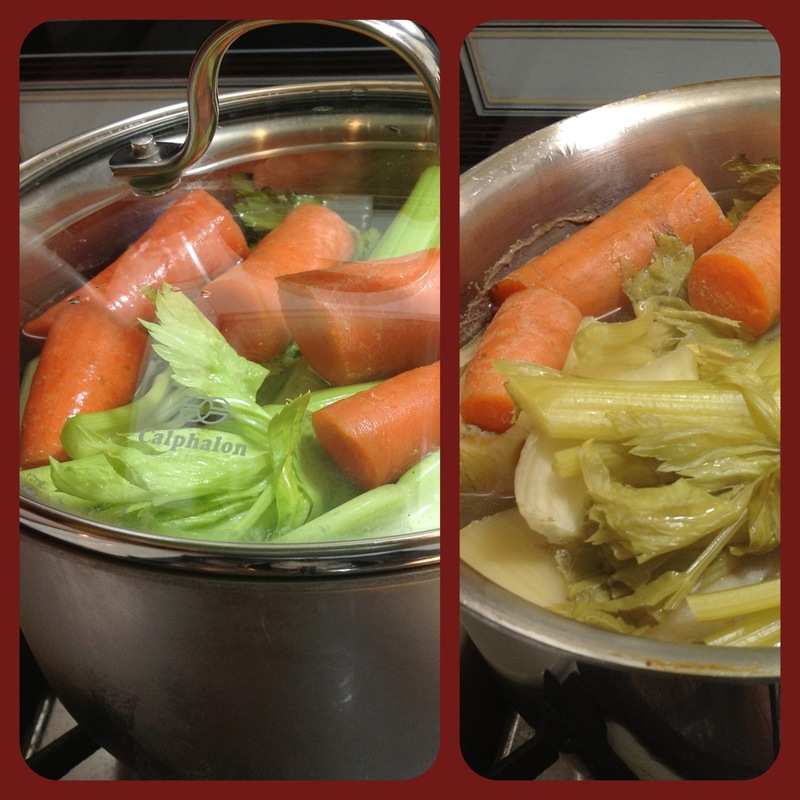 Either discard or place in the pot you have ready to make a stock. For the stock people you will need a medium saucepan some water, onion or leeks, carrot, and celery. For the non stock people discard the goodies into the plastic bag. Stock people simmer the giblets for at least 4 hours, strain and use for gravy or soup stock. Veggies with the giblets, which are buried under the all those veggies, before and after simmering for 4 hours. Sprinkle the outside of the turkey with salt and pepper, if desired, and give the outside skin a rub with some canola oil. With out a doubt, the easiest turkey to cook for the rookie turkey cook is a cook from Frozen. When the timer goes off at the two-thirds mark, wash your hands and take the bird out of the oven and take its temperature. 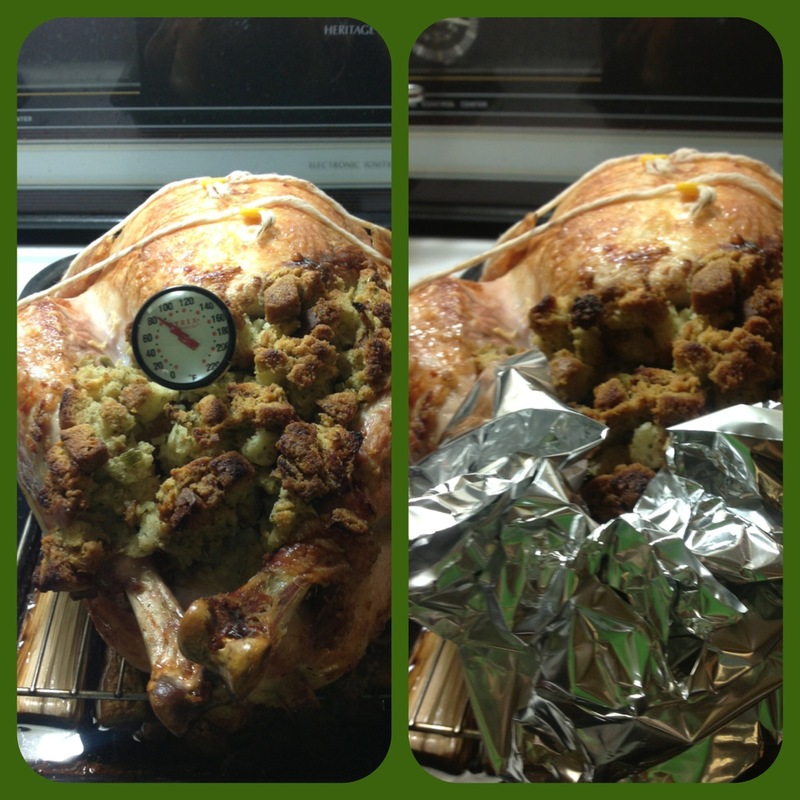 Insert the meat thermometer into the centre of the stuffing. If the legs are getting over cooked cover them with foil. Take the turkey’s internal temperature about two-thirds of the way through the cooking process and then cover the legs with foil if they are getting over cooked. Basting every hour is a waste of time – it cools down the oven and the bird cooking language that translates into a longer cooking time, and it only tenderizes to 1/8-inch. I baste only in the last hour. It’s all about internal temperatures. Don’t be wiggling the legs or cutting into the turkey. You really need that thermometer. Insert the thermometer into the centre of the stuffing. 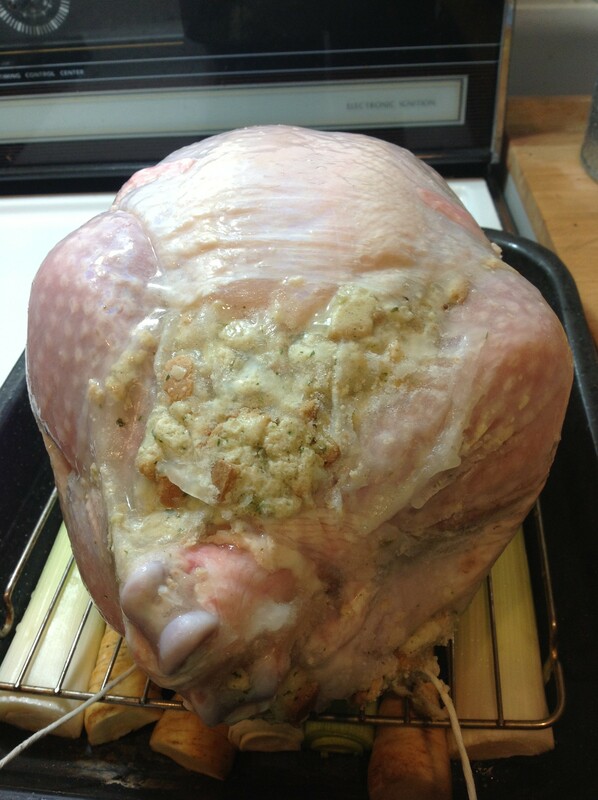 It should read 165ºF (74ºC) in the stuffing or 180ºF (83ºC) at the deep thigh. Food safety rule: always take the temperature to see if the turkey is done. If it’s hit those temperatures it’s done. Remove the turkey from the roasting pan and set it on a carving platter or leave it in the pan. Its time for “Turkey Time Out”. Believe it or not, there is a turkey under all of that stuff! 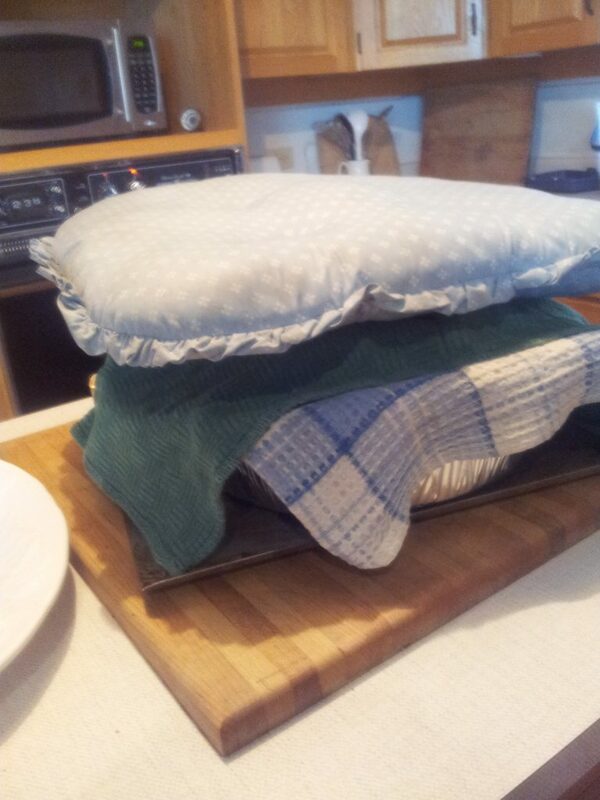 We cooked this one at the cottage and we got a little carried away with keeping it warm during Turkey Time Out. Cover the turkey loosely with foil and then cover with a tea towel and let sit for 15 minutes. This will allow the juices to redistribute ensuring that your turkey is juicy. Spoon out stuffing into a bowl. This just happens to be Marion Kane,the Food Sleuth’s, antique bowl….I accidentally never gave it back to her after a dem we did together, lucky for me she officially gave it to me a couple of years ago. Carve the turkey. There are many ways to carve a turkey this is the way I was taught. 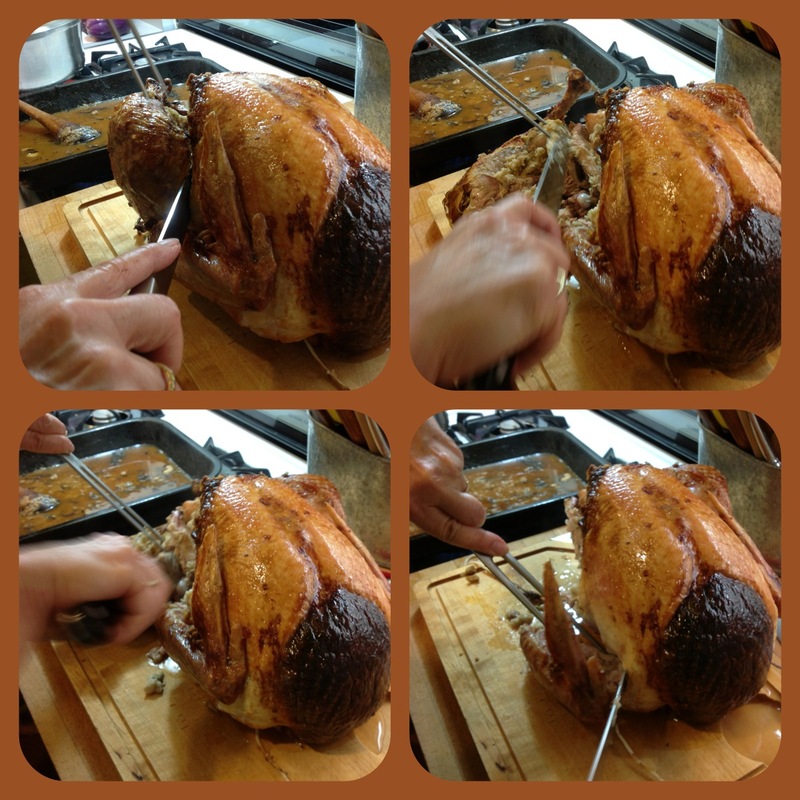 Tip #1 – Use a sharp carving knife. 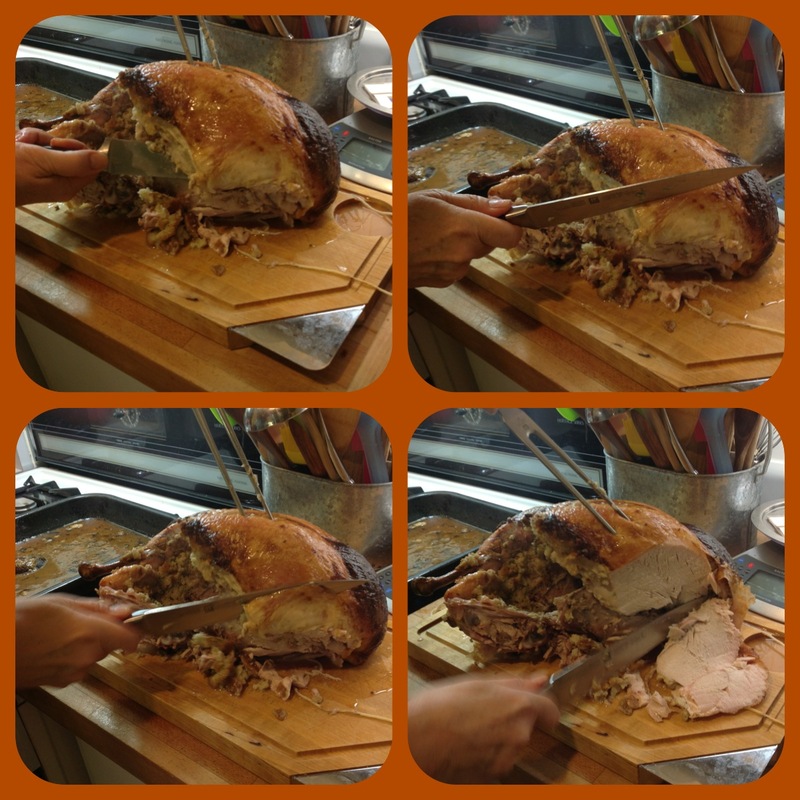 Tip #2 – Place the turkey on a carving board or a large cutting board. Cut in and up along the rib cage. If you’re having a large crowd delegate the rest of the dinner. Get your friend to bring some nibbles, your Aunt Bernice to bring her world famous sweet potatoes, and your sister to bring dessert. Christmas is supposed to be about family, friends and being grateful for what we have not a sentence to kitchen hell. Don’t be the Christmas martyr this year, ask for help. And if any of your guests are vegetarian click here for a recipe everyone will enjoy. Note: This is not a paid post, I just love cooking a cook from frozen turkey! Great turkey tips with a dash of humour! Thanks. I make a very unconventional gravy….I remove the parsnips and the leeks and put them into my Vita Mix and pulverize them. Meanwhile I add flour to the fat in the roasting pan, stirring well and browned, and then slowly blend in any vegetable water, stock or potato water I have saved, then add the leeks and parsnip puree and cook until think. Its really good. The stuffing in the pictures on this site look good. Much lighter than Butterball. It’s personal choice. My husband loves the stuffing in the PC one I love the stuffing in the Butterball. Love that you had a vote! Mairlyn you always say you dont want to steam your meat. Why not? I grew up and still do always put water in the bottom of the roaster with onions and the innards for flavour, seasonings, and cover the Turkey! I personally think the turkey has a different flavour and texture when its oven roasted in a shallow pan. Steaming makes the meat sinewy. I prefer it to cut all in one piece. It might come down to the roasting pan, your personal choice and family traditions. As long as it works for you, keep doing it.